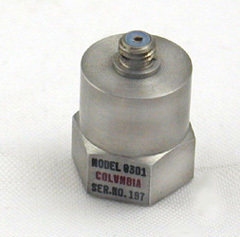 The Models 8301 and 8302 Piezoelectric Accelerometers are completely self-contained vibration measuring systems having a built-in amplifier within the housing. These units are offered in a range of sensitivities for the measurement of low to medium level broadband frequency vibrations. The Models 8301 and 8302 incorporate a ring-shear crystal mass assembly within a rugged, stainless steel body to provide an extremely reliable sensor that is virtually insensitive to environmental inputs such as base bending and thermal transients. Internal electrical damping limits the resonant Q to less than 30 dB. Signal ground is connected to the outer case of the units. Low impedance output of 100 ohms or less allows operation directly into standard readout equipment without auxiliary signal conditioning.